Three awesome heads that round off the Series One range. If you're in the market for a new head or thinking about trading in that combo for something with a little more punch… start looking here. Build. Features. Tone. Flexibility. Price. They're heavy and don't balance too well on the carry handles. These new Series One heads are built to superb standards and represent excellent value for money. We were suprised by just how much difference there is between the EL34s and the 6L6s. The DPR switch enables you to drop the amp's power down to just 10 watts. The Series One build quality remains impeccable. Over the past decade, Blackstar has developed into one of the world's leading amp manufacturers with an expanding artist list of top players, a recent Queen's Award for Enterprise (for international trade) and over 30 employees now based at the company's Northampton HQ. 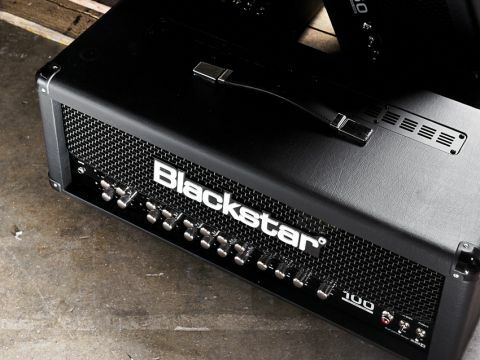 Clearly a company that doesn't do things by halves, Blackstar has recently expanded its bestselling Series One range with three new heads: the four-channel S1-104 in EL34 and 6L6 versions, and the simpler two-channel S1-50. Let's dive straight in and see how the new additions perform. All three heads have the same Blackstar look and feel: solid plywood sleeves neatly covered in hard-wearing vinyl, wire mesh grilles and steel rear panels combined with a black control panel featuring an intuitive layout and effective graphics. The build standard is very high and the attention to detail stands up to the closest of inspections, with touches such as the embossed leather carry handle and two-tone corner protectors leaving one in no doubt that these are serious pieces of pro-level equipment. This is further reinforced if you look inside the deep steel chassis: the Series Ones are built on printed circuit boards that are laid out and produced to an exceptionally high standard. There are five main boards, including two for the front and rear panels and three more for power supply, preamp and power valve bases. Wide tracks for audio signals combine with top quality components: one PCB is dominated by a large alloy heatsink that cools the devices used in the Series One's Dynamic Power Reduction circuit. All the boards are joined together using Molex-style connectors, but with individual wires rather than the more common ribbon cable - this adds significantly to reliability and ease of servicing/fault diagnosis. All three heads are large and very heavy, thanks to massive mains and output transformers. They could balance better on their carrying handles when picked up, but that small criticism is all we can find. Overall we're very impressed - the Series Ones combine audiophile valve know-how and digital expertise with rugged reliability and good looks, while the manufacturing standard of its Korean plant easily exceeds that of many European and US-built products. The two S1-104 amps are proper four-channel heads, with four pairs of gain and channel volume controls feeding into two sets of EQs: one for clean and crunch and the other for the two overdrive channels. The clean channel features a bright/warm switch that also reconfigures the output stage to run in class A or Class AB to further emphasise the different characters. Similarly, the crunch channel can be run in normal and super crunch modes, the former providing a lower gain crunch with a looser feel, while super crunch boosts the gain and tightens up the damping for a modern crunch metal tone. In addition to bass, mid and treble, both EQs have Blackstar's ISF control, which progressively morphs the tone circuitry from British to American values, significantly expanding the amp's sound shaping abilities. "The build standard is very high, leaving one in no doubt that these are serious pieces of pro-level equipment." There are four controls for presence and resonance - shaping the power amp's overall high and low frequency response - and an overall master volume combined with the Dynamic Power Reduction control, which varies the amp's output from 100 watts down to just 10. This is accomplished without putting any extra components in the crucial link between power valves, output transformer and loudspeaker. Rear panel features include a speaker-emulated line out with balanced and unbalanced connectors, a series effects loop with switchable levels and a pair of MIDI in and thru sockets that power the channel switching, alongside the included foot controller. The differences between the 6L6 and EL34 versions extend well beyond the glassware and different coloured control knobs. "They're tonally very different, with significant changes in preamp circuitry," explains Blackstar's MD, Ian Robinson. "The EL34 is aimed at getting the quintessential Brit rock sound, while the 6L6 amp has a more aggressive US metal-influenced sound." With the same basic construction, the S1-50 is a scaled-down 50-watt version of Blackstar's two channel S1-100, which basically features the top row of the S1-104's control panel, with two pairs of gain and volume controls for clean and overdrive channels feeding one EQ network. The warm/ bright and normal/super crunch functions are retained, giving this more affordable amp a choice of four distinct voices, which can be switched using the supplied controller or via MIDI, while the DPR works down to five watts instead of 10. The new amps fire up with a bare minimum of noise - just a little hiss and practically zero hum - indicating that these are well-sorted amp designs, as you'd expect from Blackstar. The clean channel on all three is exceptionally versatile, with glassy 'Blackface'-inspired highs at moderate gains that cut through without becoming shrill. Up the gain and volume, lower the DPR, flick the bright switch and you're in AC30 territory, with slightly pushed power stage drive adding subtle chime as the power stage reconfigures into class A, with less speaker damping for a wide dynamic response. The crunch and super crunch modes cover a huge gain range, taking over from the clean channel's subtle dynamic overdrive and extending to a huge modern crunch tone that can make the weediest Strat sound rockin'. The two different overdrive modes serve up huge distortion effects, with practically endless sustain at higher settings. OD1 is a little more aggressive and is at home with metal and thrash, OD2 is fatter and rounder, making it better suited to Satch or Vai-style warbling. Even without these two lead channels, the Blackstar Series One preamp packs enough tone and drive to satisfy practically any need. We expected the 6L6 S1-104 to sound different, but it is surprising just how much of a difference there is. The 6L6 is often associated with more polite tones, leaving all the bite and aggression to the EL34; however, with the S1-104, this seems to have been reversed. This means the beam-tetrode-powered version has a harder and more in-your-face tone that's perfect for modern USA-approved rock. The S1-50 head greatly impressed us too, despite only having the top half of the S1-104's control panel, its lower output power adding yet more versatility as the power amp drive effects were more noticeable. The slimmed-down preamp still gives it access to a huge range of crunch and clean tones, with super crunch mode adding more than enough gain and distortion to serve most soloing needs. The lower output wattage of this amp, plus its simpler and more approachable control panel, won us over. We found it easy to dial in and get exactly the right balance between preamp gain and power amp drive for some killer blues and classic rock tones. On all three amps the speaker emulated line out sends a clean and powerful signal straight to desk that needs hardly any work to sound superb; for recording just add a touch of compression and you're there. These three new heads expand what is an already excellent range aimed at the pro/serious amateur end of the market. The four-channel S1-104 amps are ideally suited to players who need to produce a wide range of sounds at the tap of a button - add any decent quality MIDI effects unit and the variety of tones these two amps are capable of producing is practically infinite. They're perfect for semi-pro cover band specialists or pro players who need to faithfully reproduce recorded guitar tracks for live shows. But don't dismiss the S1-50 as just a budget option; its highly responsive tones and relative simplicity make this more of a player's amp, notwithstanding the fact it shares the same useful MIDI flexibility as its siblings. And along with the superb build standards, we think all three heads represent truly excellent value for money. There's a lot of competition at this particular price point, but not much of it can match these Blackstars for tone, flexibility, features and sheer 'I want' appeal. Beyond any doubt, three very good reasons to get back into stacks!